Why choose between luxe fashions and smart, functional wear when you can have both? Just like a chef will always insist that everything plated should enhance a dish, we’re in the era where having a quality product isn’t enough. We need to get more bang for buck when it comes to what we choose to invest and adorn ourselves with. Technology has already realised the power of fashion and actively seeking partnerships to change the way we view wearable technology. 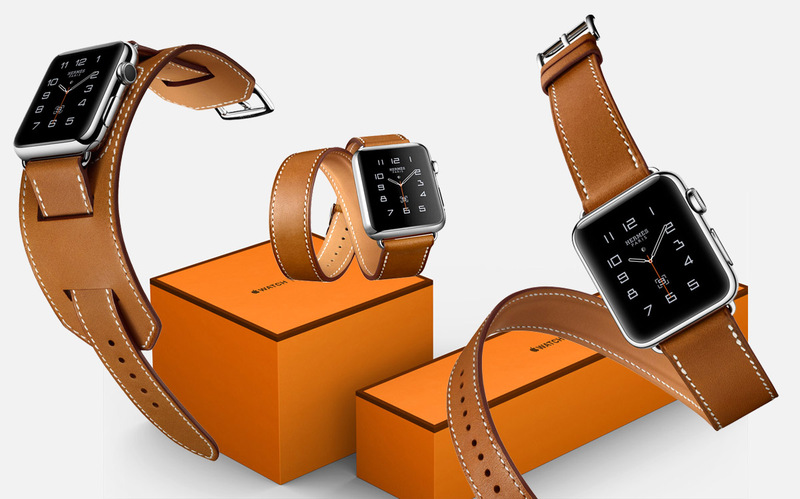 Take for example, Apple’s partnership with Hermés in September 2015. Both brands are powerhouses in their own right but together they created trend-chic gold, with the tech integrated seamlessly into beautiful everyday items. So who else is making strides in the smart wear game and can be taken as a source of inspiration when it comes to pushing the envelope? We’re not saying that there is a cult movement around the Fitbit, but you can’t deny that it has become a fashion/fitness staple over the past couple of years. However, the Fitbit Flex 2 comes in an elegant pendant, hand-polished bangle and wristband to give you the versatility that fits into YOUR life. So you can still have your all-day activity tracker showing you your active minutes. Calories burned, steps taken, stationary time and hourly activity whether you’re at a meeting, wedding, going for a swim (yes, its water proof) or painting the town red with the mates. Plus it has approximately 5-day battery life. 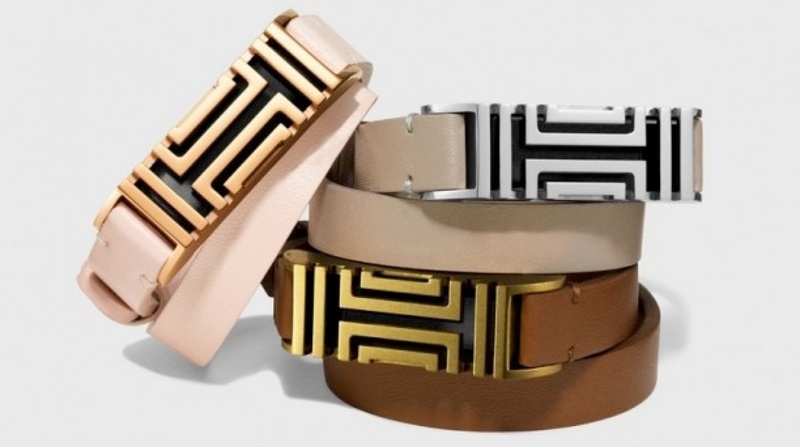 Then there’s the Tory Burch x Fitbit offering. The American designer’s style has been incorporated to give the elegant-edge to the gold-plated necklaces and bracelets in the range. It’s the same health tracking technology with the chic feel of adult-approved jewellery. What better way to hide that you’re rocking a piece of tech than by throwing on (read strategically and meticulously) Swarovski studs? Created by London based start-up Vinaya (previously Kovert Designs), the biometric bracelet syncs with an app to help the wearer to design their schedule to reduce stress and improve wellbeing. 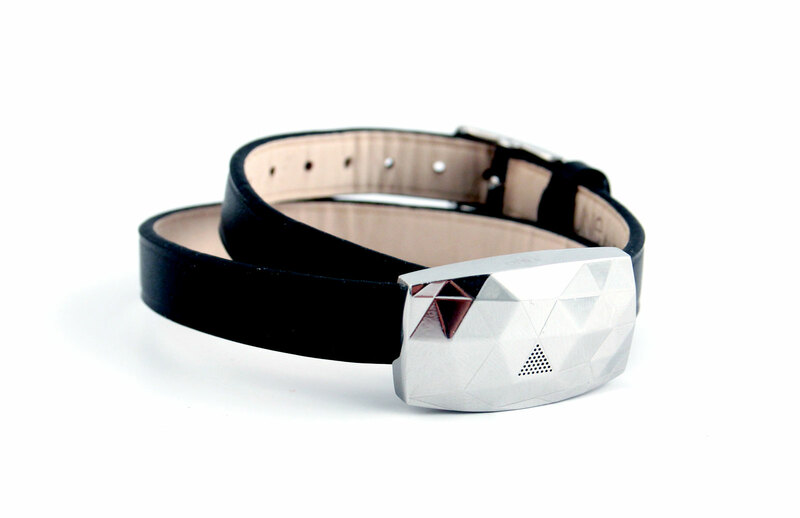 If Swarovski is not your style, there are leather and sport bands options. This is a follow up project from Vinaya, the first being the Altruis whose main function is to alert the wearer of important notifications. By important, we mean that the wearer decided what predetermined keywords (such as kids, fire, and money) would allow certain notifications to come through. It comes as either a bracelet, ring or pendant, since the main unit is extractable. It also comes in gold, platinum and rose gold if you were wondering. 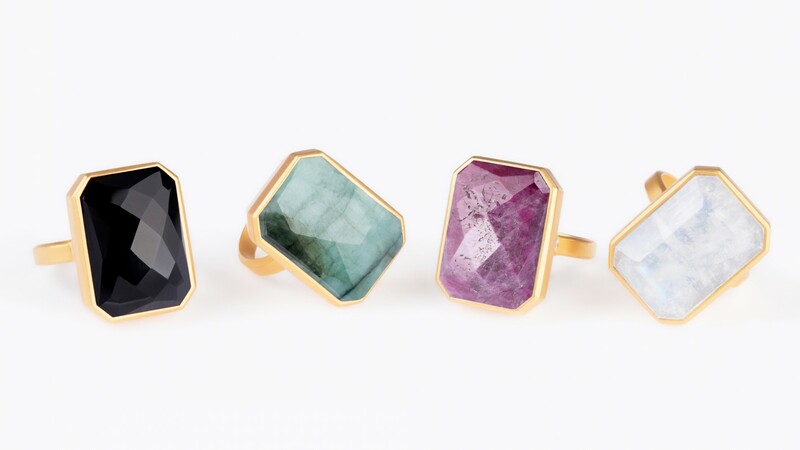 This 18k gold ring set comes in emerald, pink sapphire, black onyx, moonstone or the limited edition tourmalated quartz. It connects to both iOS or Android phones to connect you to calls, texts, Ubers arriving, meeting alerts through vibration patterns and colours. The aim is to help you multitask, with just a quick glance at your ring, while looking fabulous doing it. 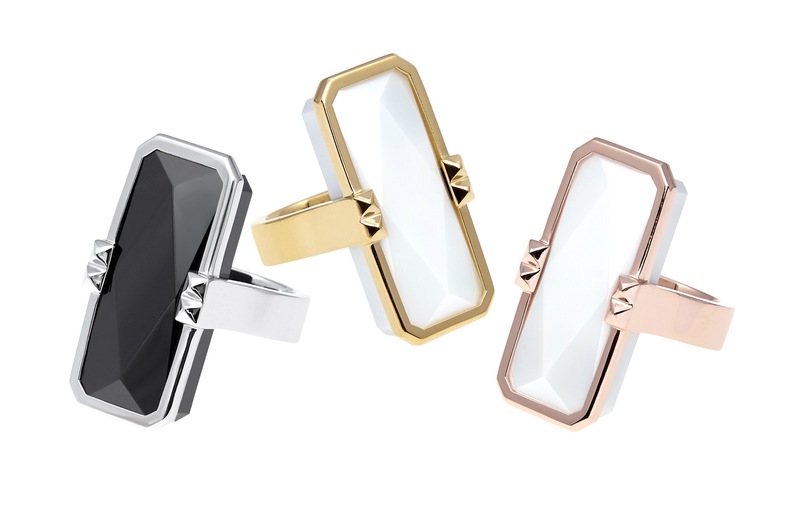 If you’re not a ring-kind of lady Ringly also has a smart bracelet known as Aries. Same concept, only with a fitness tracker and slightly longer battery life. 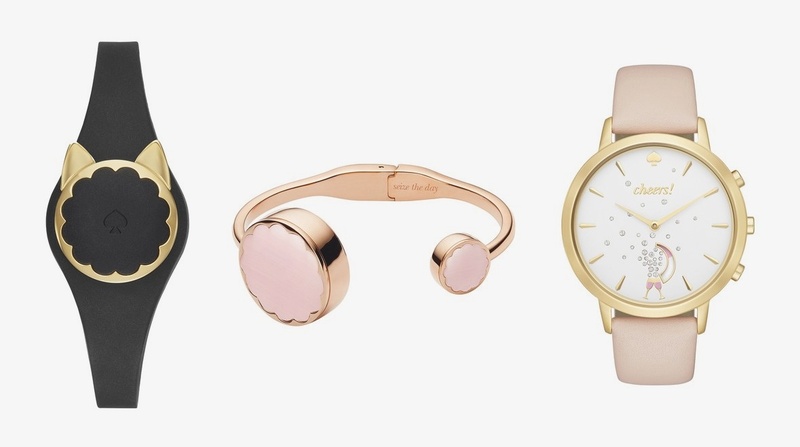 Partnering with the Fossil Group, Kate Spade released the connected activity wearable that is available as a smartwatch, bangle, and a silicone tracker. Apart from monitoring your activities and sleep pattern, it also helps you to control music. On a quick side-note, cat lovers, there is a black silicone fitness tracker watch with a cat motif (silent squeals). This is Kate Spade’s second dabble in wearable technology. The company had previously worked with Everpurse to create handbags and accessories that charge iPhones. Made for women, the broach or necklace comes in two styles; there is the limited edition made from dark mash wood and gold leaf, or the standard stainless steel and wood design. It tracks everything from your sleep and steps, to menstrual cycle and fertility tracking. 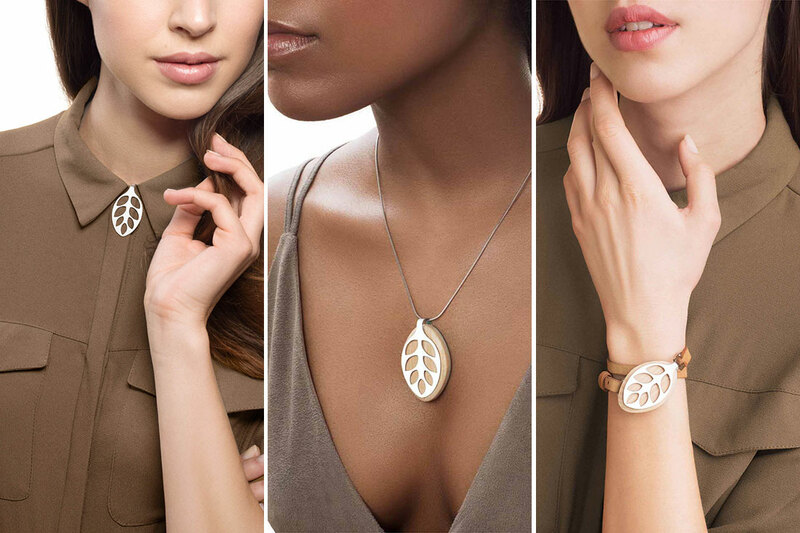 Their newer version, Leaf Urban, is a sleeker design complete with meditation goals and water resistant feature. Whether you’re using the Leaf Nature (the original) or the Urban, it combines the data it has collected and releases a simple graphic to inform you on your ability to deal with stress. Another element that makes the Leaf collection so special is that it gives you the power to track both your health and well-being all on one app with the battery life that lasts for at least two months. Fashion accessories are a teen-girl’s best friend and companies like Gemio want to bring technology into that mix. Think about this product as the smart version of a friendship bracelet. Once paired, the bracelet can let BFFs (that’s still cool to say right?) receive coded messages through a light pattern from the bracelet. It allows friends to create a secret code of communication via the light messaging system that have been pre-programmed to light up in specific ways. But that’s not the only thing it does. The Gemio uses optical colour sensors to sense the hues from your outfit of the day and match it accordingly. 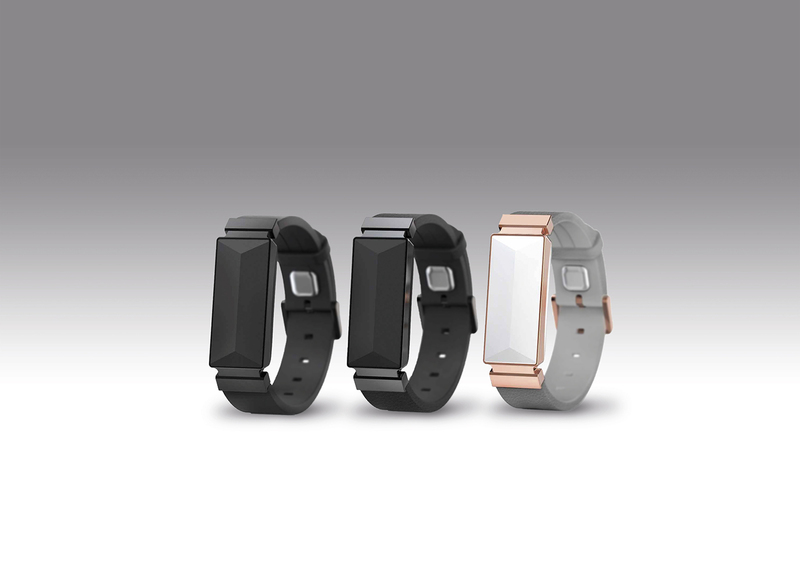 It can also light up to music your listening to using the accelerometer and microphone in the smart jewellery. If you’re horrible at remembering to slather on your sun block, June – which looks like just another leather or silicone wrist band, constantly monitors the UV exposure levels throughout the day. Made for iOS, it then notifies you when you should apply or reapply your sun cream using the World Health Organisation’s UV Index in real time. Limiting sun exposure contributes to healthier skin and slows down the onset of wrinkles. It comes as a double-strap black leather and a black silicone for sportier. The only downside is that you need to be in direct sunlight for a perfect reading. Review on weareable.com allege that obstructions such as being under an umbrella can distort the reading. In partnership with Intel, Opening Ceremony’s Carol Lim and Humberto Leon have created, the luxe snakeskin cuff embedded with semi-precious stones MICA (My Intelligent Communication Accessory). 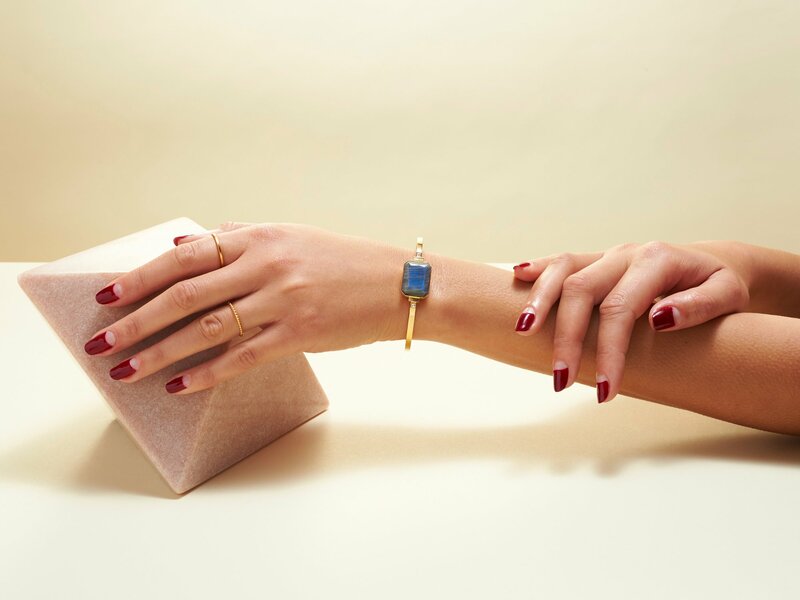 The smart bracelet is definitely on the high-end spectrum of jewelry offerings with ‘18 carat gold plating and a curved sapphire touchscreen’. It gives you access to your calendar, email, social media pages, as well as sms alerts. Unlike other jewellery it doesn’t need to be connected to a phone as it comes with a two-year wireless plan in the United States. How can you improve this wardrobe staple, the trench coat, which has been made from luxury Italian label Loro Piana’s water and wind-repellent cotton and cashmere-blends? Founder Rana Nakhal Solset decided to incorporate patented infrared and battery-operated technology to warm the wearer at varying degrees in an inconspicuous manner. The designs, which offer a trench and a wrap-coat for women and a rain mac (aka waterproof macintosh which we know as rubberized raincoat) and overcoat for men, have the technology hidden in the lining to provide heat to areas such as the shoulders, the lower back and the front lapels as well. 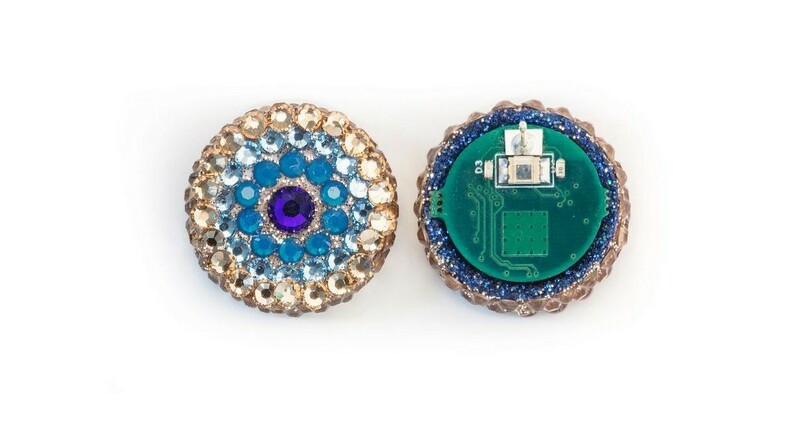 Disguised as chic earrings, the Ear-O-Smart monitors calories, heart rate, and activity level. The reason behind the unique approach –accessory wise- lies in the tradition of physicians checking the earlobe for heart rate and blood oxygen readings in a patient. The creators believe it provides a more accurate reading than a device made for wrists or a chest strap, due to the high level of blood supply to the lobes. Plus no-one would believe that your earrings are hard at work will you go about your daily activities. 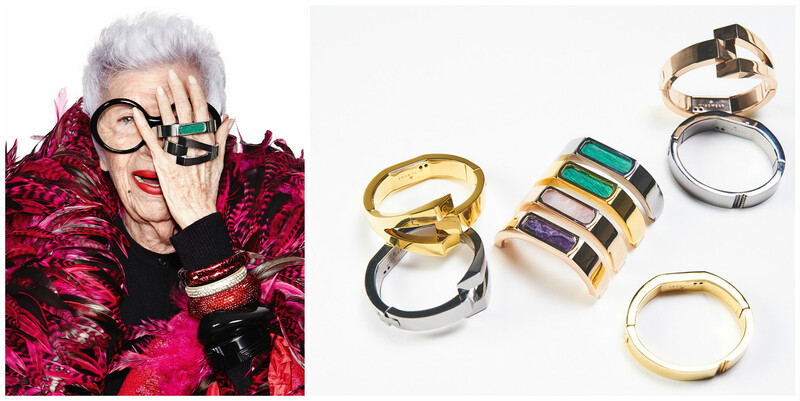 This list wouldn’t be complete without the wearable tech from fashion icon Iris Apfel, 94. Since you know Apfel was involved in the design element of the creation process, you know it will not compromise your style in any way whatsoever. It’s also a line that gives women the power to monitor their health without looking like they’re en route to the gym. This is a notable change from the fashionista, who has previously declared wearable tech as ugly and a move she’d never, ever do. “If a technology is going to strive to save my life, then at least take the next step to make me look good while doing it,” she told Mashable. The collection features three distinct and luxurious bracelets, namely Kingston, Duchess and Calder. They feature the norm tracking and mobile notification features but it also has the ability to discreetly send out an SOS message to a pre-approved list of people in case of emergency. If activated, it will send out an exact geo-tagged location. There’s so much happening in the world of wearable tech that we couldn’t fit it all in this post. Notably, we didn’t find anything from our beloved continent (correct us if we’re wrong) but that doesn’t mean we can’t start now, creating wearable tech that suits the reality of someone on the ground. In fact, if you do know of some cool technologies being made on the continent, we’d love to know! Drop a comment below or tag us on social media so we can spread the word!